Have you been Poshed!? 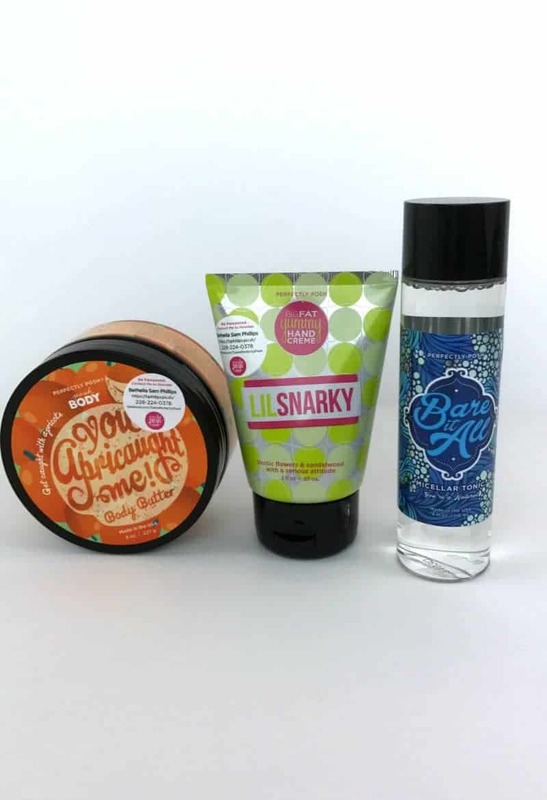 Perfectly Posh wants to help every woman and girl practice self-love and indulgence by offering a wide variety of products that smell delicious and are nourishing to your skin. Their bold bright colors and tongue-in-cheek names have made Perfectly Posh stand out and become known in the direct sales industry. I have been a huge fan of Perfectly Posh and love not only their great products but their culture of family within their organization. Independent Perfectly Post Consultant Bethella Phillips is one of the Consultants leading that culture of support, and I was excited that she signed up to be featured again in our Christmas in July Event. Independent Perfectly Posh Consultant Bethella Phillips sent in a Posh To Meet You Set with three of her favorite Perfectly Posh Products. First let me say, if you do not have some of their Big Fat Yummy Hand Cream – you are missing out. I have a tube on my nightstand, on my desk, in my purse, in my car… well you get the idea. They not only smell beyond amazing, but they make my hands feel so soft and hydrated – which is good for someone who spends a lot of time working with her hands! Their Body Butters are equally as wonderful – my daughters often snag those for themselves to put on their knees and elbows to keep them looking moisturized. I had not tried their Bare It All Micellar Tonic before – but I LOVE how with just a cotton pad I can take my makeup off with one swipe! Perfectly Posh proudly offers Purely Pampering Products. We carefully select the lines, fragrances, and ingredients we offer you to let you indulge your body and mind. Whether you have a day to enjoy or just a few minutes, we give you products that you can be proud to wear and to share. We are made from the very best ingredients on earth. From luxurious shea and cocoa butters, to indulgent and nourishing oils, vitamins, and more – you can be sure that our products are the highest-quality formulations you can find. Our pampering that is spa-grade, long-lasting, and a fabulous experience. Whether you want to take a long, leisurely bath, or need to brighten your mood on the go: Posh is for you. Learn more today about our fabulous natural pampering products. All Perfectly Posh products are paraben and paraffin-free, free of sulfates including SLS, have no gluten, lanolin, or soy ingredients, use the highest-quality essential oils and fine phthalate-free fragrances, use natural enzymes and gently moisturizing vitamin E to preserve the life and look of our fun pampering products, and cruelty-free and do not test on animals! You can check out everything Perfectly Posh has to offer including incredible products, great hostess benefits and opportunity on Bethella’s website.